NOT ANYMORE MY FRIENDS – I pulled my big girl sleeves right up and got stuck into this mammoth recipe – and wow was it worth it! 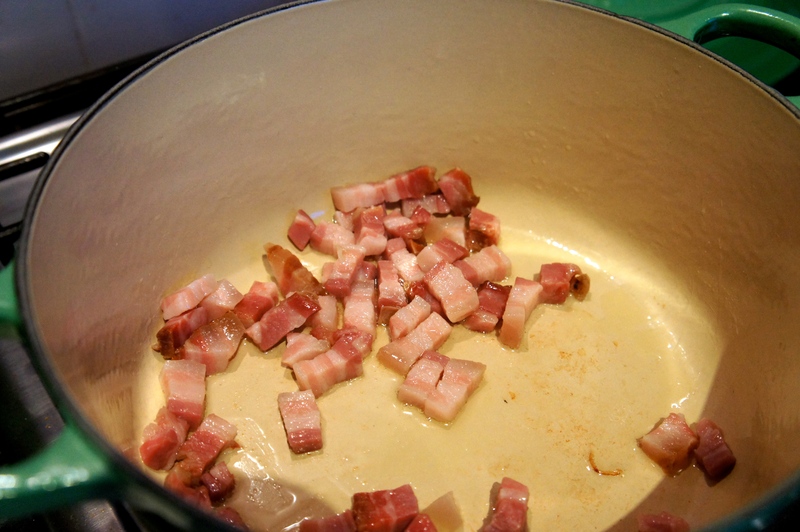 Heat the fat from the lardons in your casserole until almost (ALMOST) smoking. Dry beef in paper towels (it won’t brown if it is damp) and then add your beef, a few pieces at a time and sauté until nicely browned on all sides. 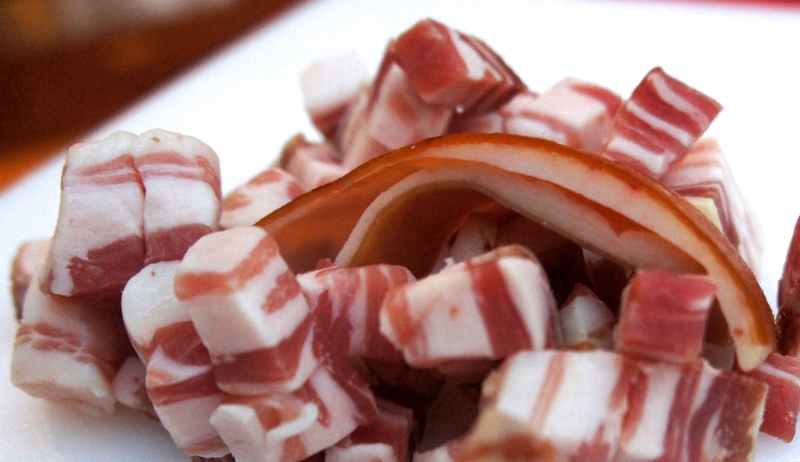 Add it to the lardons in the side dish. 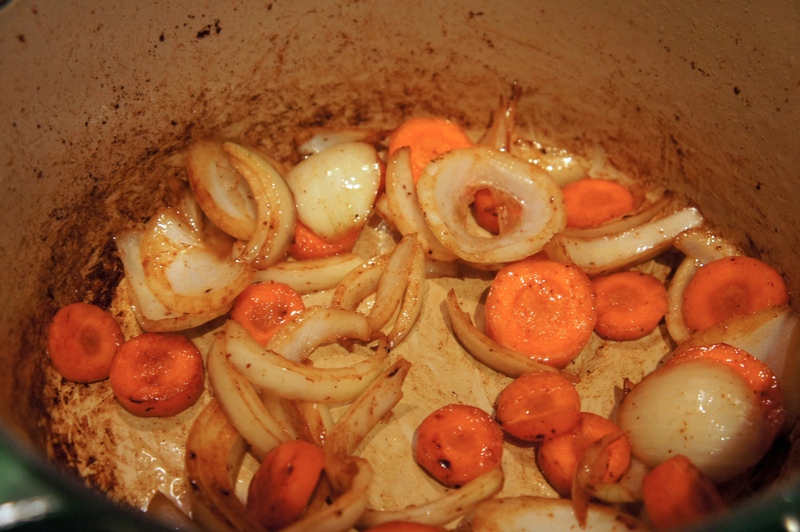 In the same fat, brown the sliced vegetables (onion and carrot). At this point dear Julia kindly says “Pour out the excess fat” – babes, what excess fat!? I got the meat at my very favourite butchers (this place has a queue outside it each and every weekend without fail, I’m telling you – their meat is legit), so I didn’t have anything to pour out, but if you do – chuck it! Return the beef and bacon to the casserole and toss with 1/2 teaspoon salt and 1/4 teaspoon pepper (I totally Jamie Olivered this bit). Then sprinkle on the flour and toss again to coat the beef lightly. Set casserole uncovered in a middle position of your preheated oven for 4 minutes. Toss the meat again and return to oven for a further 4 minutes (this browns the flour and covers the meat with a light crust). Remove casserole and turn oven down to 160C (325 degrees, always thinking of you America!). Stir in your young, full-bodied wine (sounds well cheeky!) and 2 to 3 cups of beef stock – just enough so that the meat is barely covered. Add the tomato paste, garlic, herbs and bacon rind. Bring to a simmer on top of the stove. Cover casserole and set in lower third of oven. Regulate heat so that liquid simmers very slowly for 2-3 hours. The meat is done when a fork pierces it easily. 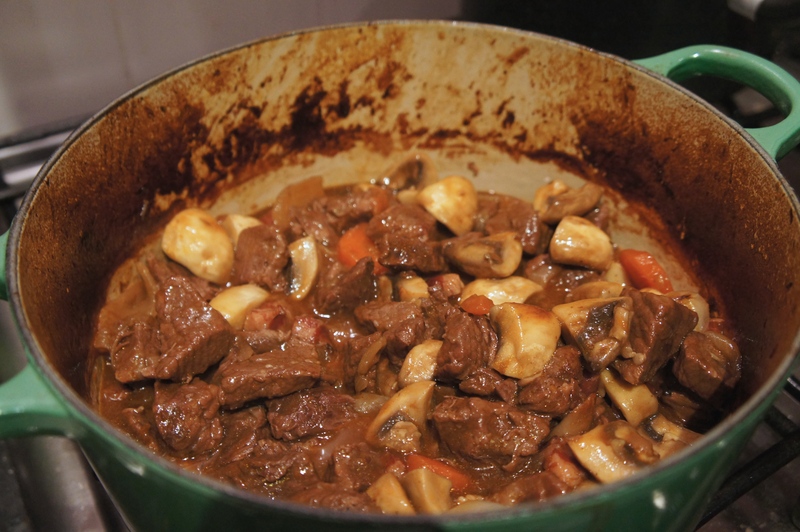 While the beef is cooking, prepare the small onions and mushrooms. Heat 1 1/2 tablespoons butter with 1 1/2 tablespoons of the oil until bubbling in a pan (skillet). Add onions and sauté over moderate heat for about 10 minutes, rolling them so they will brown as evenly as possible. Be careful not to break their skins. You cannot expect them to brown uniformly, so no fretting here please and thank you! Add 1/2 cup of the stock, salt and pepper (to taste) and the herb bouquet. Cover and simmer slowly for 40 to 50 minutes until the onions are perfectly tender but hold their shape, and the liquid has evaporated. Remove herb bouquet and set onions aside.Wipe out pan and heat remaining oil and butter over a high heat. As soon as you see that the butter has begun to subside, (indicating it is hot enough), add your mushrooms. Toss and shake pan for 4 to 5 minutes. As soon as they have begun to brown lightly, remove from heat. 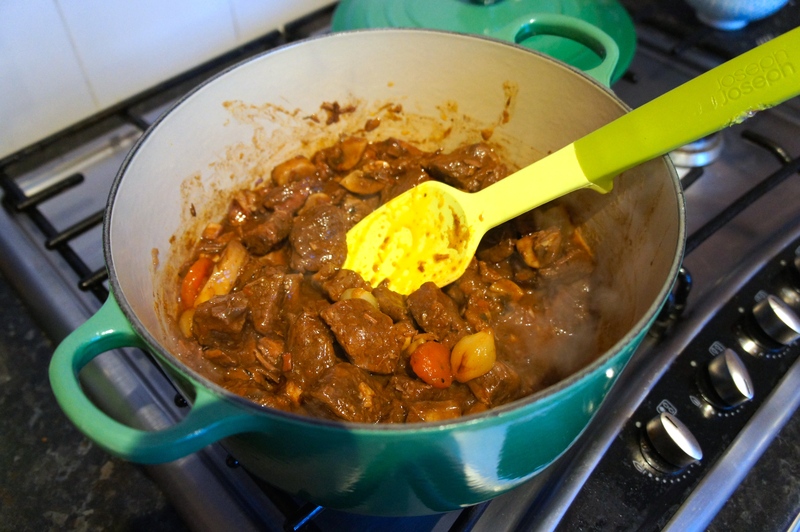 When the meat is tender, pour the contents of the casserole into a sieve set over a saucepan. Wash out the casserole and return the beef and lardons to it. Distribute the cooked onions and mushrooms on top. Skim fat off sauce in saucepan. Simmer sauce for 1-2 minutes, skimming off additional fat as it rises. You should have about 2 1/2 cups of sauce thick enough to coat a spoon lightly. If too thin, boil it down rapidly. If too thick, mix in a few tablespoons of stock. Taste carefully for seasoning and remember if you’re making this ahead of time, it will develop, so go careful – don’t go full throttle Jamie Oliver or anything! Pour sauce over meat and vegetables. Cover and simmer 2 to 3 minutes, basting the meat and vegetables with the sauce several times. 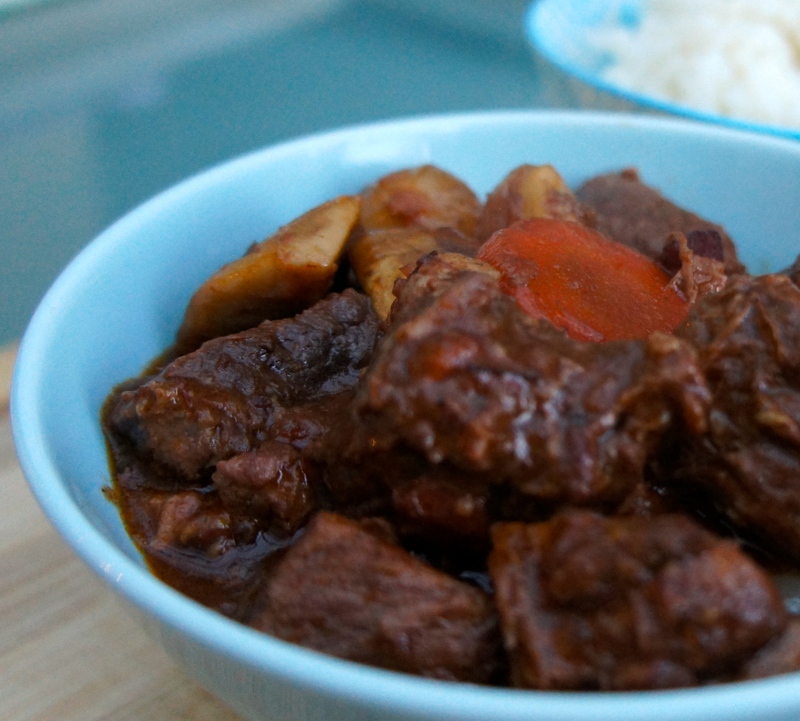 Serve in casserole, or arrange stew on a platter surrounded with potatoes, noodles or rice. This dish is just the bees knees – the beef practically melts in your mouth and the wine, cooked through everything gives such a wonderful flavour, we could not get enough of it! 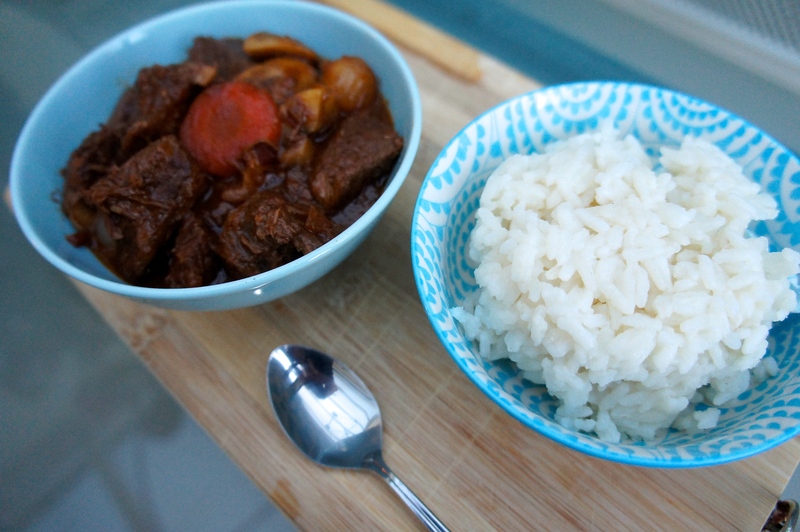 Traditionally the stew is served with potatoes, but as I find it quite heavy anyway, I like to have mine with a bit of rice. Profitez de mes petites beautés – Jusqu’à la prochaine fois! I did indeed see the film – yes, Barty and I are getting along famously!! 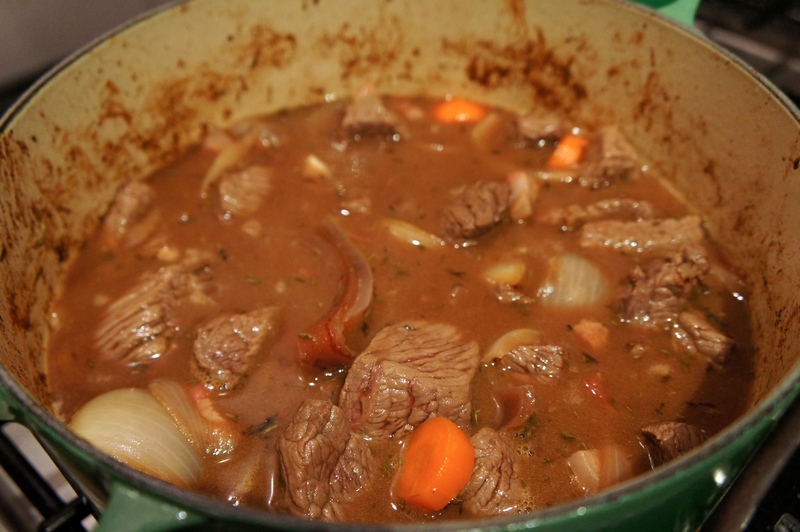 Boeuf Bourguignon is one of my husband’s and my favorite things to make but I’ve never tried Julia’s recipe! Now you’re inspiring me to steal my mom’s cookbook and give it a whirl!